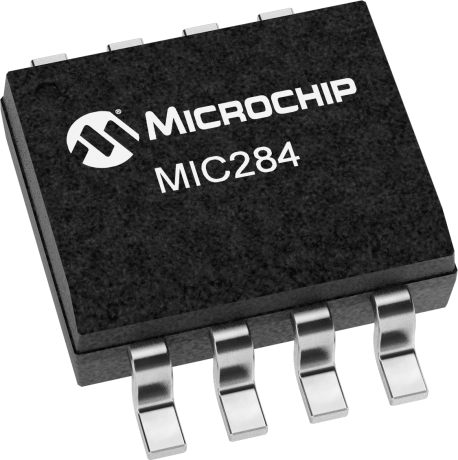 The MIC284 is a versatile digital thermal supervisor capable of measuring temperature using its own internal sensor and an inexpensive external sensor or embedded silicon diode such as those found in the Intel Pentium III® CPU. A 2-wire serial interface is provided to allow communication with either I2C or SMBus masters. Features include an open-drain over-temperature output with dedicated registers for implementing fan control or over-temperature shutdown circuits. Interrupt status and mask bits are provided for reduced software overhead. The open-drain interrupt output pin can be used as either an overtemperature alarm or a thermostatic control signal. A programmable address pin permits two devices to share the bus. (Alternate base addresses available-contact Micrel.) Superior performance, low power and small size makes the MIC284 an excellent choice for the most demanding thermal management applications. The MIC284 is part of the SilentSense® family of thermal supervisors. Data sheets and support documentation can be found on Micrel's web site at www.micrel.com.